Sirisena came into power in 2015 promising to help the war-torn country reconcile, including by investigating allegations of crimes under the watch of his predecessor, Mahinda Rajapaksa. But the transitional justice issue has always been controversial and unpopular with many of Sri Lanka’s majority Sinhalese population, who believe such efforts would unfairly punish “war heroes.” Faced with public resistance, Sirisena has backpedaled on his campaign promises in recent years, adopting a Sinhalese nationalist stance and declaring that he will “not allow war heroes” to be hauled before the courts. Since Rajapaksa lost his re-election bid, the strongman has built a party and has gained traction with victories in local elections. 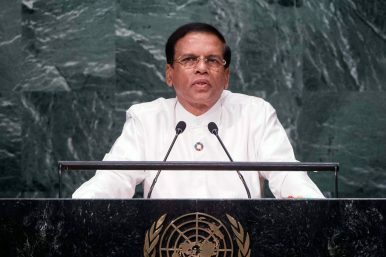 With an eye toward elections next year, Sirisena’s opposition to the United Nations resolution appears to be his latest attempt to ally himself with Rajapaksa and tap into his majority Sinhalese voter base. Sirisena abruptly sacked Prime Minister Ranil Wickremesinghe in October last year and appointed Rajapaksa to replace him. The political crisis ended after a Supreme Court ruling reinstated Wickremesinghe, but deep tensions remain between Sri Lanka’s president and prime minister. The two leaders have functioned as rivals within one government, positioning themselves to face off in elections that must be scheduled by the end of 2019. Sri Lanka’s 26-year civil war ended in 2009 after government troops crushed the Tamil Tiger rebels, who had fought to create an independent state for the country’s ethnic minority Tamils. According to conservative UN estimates, at least 100,000 people were killed in the war. A UN experts’ panel report later said about 45,000 ethnic Tamil civilians may have been killed in the final months of the fighting alone. What happened at the war’s bloody end remains murky because Rajapaksa’s government expelled international journalists and aid workers. After Sri Lanka’s foreign ministry said it would support a U.K.-led resolution giving Sri Lanka two more years to fulfill its promises, Sirisena told a local newspaper that he was considering pulling out of the UN process altogether. He later said he would send a delegation to Geneva to ask the Human Rights Council to allow Sri Lanka to deal with its problems on its own. But finally, Sirisena agreed to send Foreign Minister Tilak Marapana, from Wickremesinghe’s party, and three of his nominees to Geneva. Marapana said the delegation would express the country’s reservations over certain sections in Bachelet’s report but would support the resolution as planned.